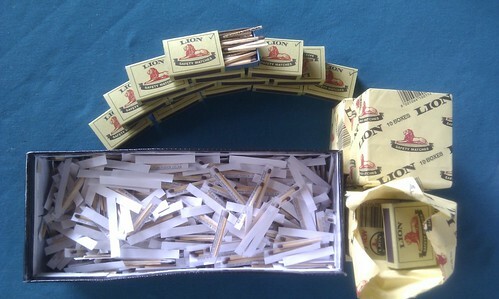 I have about 2000 matchstick ready. They are for my next idea to find the now 117 people I need to still meet, who will trade with me by buying one of my Springleap T-shirts. This idea happens on Monday 28 February. My fab friends Jolandie and Genevieve will be joining me – together with whoever else wants to join in (contact me if you keen!) – and we will be standing on the busy intersection of Grayston and Rivonia Road in Sandton, Johannesburg. We're going to be there early, and catch the rush hour traffic as people make their way to work. Amongst the hundreds of people who will pass us, we will be handing out matchsticks, hoping to find at least a couple of dozen more people who will help me. My mom helped create the shoebox full of matchsticks stuck to my web address, and Jolandie and I have been writing hundreds of my "business cards", and I have a few more boxes to still write in time for Monday morning. So if you pass us by, give us a wave, and help spread some matchstick love! 1. Change your profile picture on Facebook to a matchstick on Monday, and let your friends know why, and direct them to onematchstick.co.za. There are some pictures to use here. 2. Invite friends to this event on Facebook here. 3. If you live in Sandton, Johanneburg and pass us by on Monday, give us a wave, and cheers us on! Also take a photo and upload it to twitter and facebook. 4. Be one of the 117 people I still need to meet and buy one of my T-shirts (you buy them online at springleap.com and just use the coupon code onematchstick (one word, lower case) so that we can track it), and email me your order number to onematchstick@gmail.com. 5. If you don't want a T-shirt, but want to support me, consider one of these 3-way trades where you get a product or service (ranging from diamonds to pilates classes. 7. Enter the onematchstick Joke Competition and you could win a Springleap Tshirt. 8. Join the onematchstick page on facebook. It's time now that I finish this T-shirt trade. And I will. I just need to keep finding ways to reach those last 117 people. Can you help me?